It’s hard to imagine a design more simple than a basic straight line. Stack two or more straight lines, and you have stripes: clean, easy on the eyes, and infinitely variable. Perhaps that’s why the most common patterns used to decorate interior walls are stripes in all their glorious variations. Horizontal, vertical, one stripe, lots of stripes, jagged stripes, colorful stripes: Whether you choose to adorn just one accent wall with straight-edged fun (as in the beautiful bedroom from CDA Interior Design shown here), or go all-out and encircle the entire room with stripes, it’s a reasonably easy DIY project that will add a hefty dose of wow to your bedroom. Painting basic stripes on the wall is easy enough; just decide how thick you want the stripes to be, use painter’s tape to mark off the borders, then fill in the lines with your desired color of paint. If you’d rather not be bothered with a paintbrush, there are many striped wallpapers. With today’s easy-up, easy-down wall coverings, you can even decorate a rental’s walls with your favorite pattern. Need some inspiration? Here are 25 bedrooms that show off the range and versatility of geometry’s most basic design. This gorgeous contemporary room from Atelier Interior Design shows off the most common orientation of wall stripes: horizontal. It’s easy to paint horizontal stripes, and as a plus, they make a small room look larger. While the soft stripes here are wallpaper, you could achieve the same effect with crackle glaze and paint. For the best appearance, keep your stripes between five and 10 inches wide. If you want to add a statement, yet not an exclamation, try one oversize horizontal stripe wrapping around the center of your walls, as in this room by Ragan Corliss of Decorating Den Interiors. Stripes are a wonderful way to add fun to a child's bedroom. What little girl wouldn't love the exuberant girliness of this pretty bedroom from Jennifer Brouwer Design? 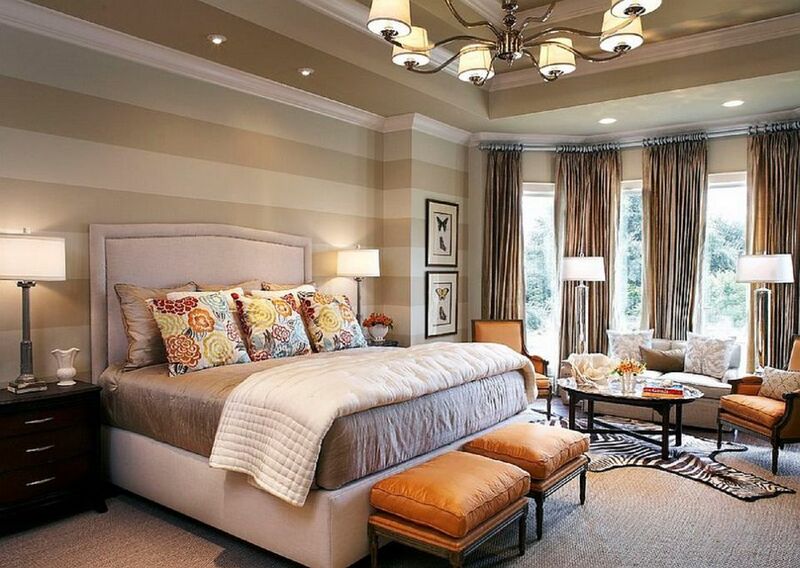 While horizontal stripes make a small bedroom look bigger, vertical stripes make a low ceiling look higher. And while horizontal stripes add the most impact when fairly fat, vertical stripes are strongest when they are thin. The simple style of minimalism doesn't mean there can't be any personality or spark. For proof, check out the bedroom from Ambience Home Design shown here. This room would be a snooze without the impact of the brown striped walls and the wonderful striped bed, but with them, it's a stunner. Looking for a touch of glamour in your bedroom? Then consider adding softly metallic stripes, as in the bedroom from Ambience Home Design shown here. Wow! Looking for big style in a boy's bedroom? Or actually, in any bedroom? Then consider creating a striped wall by layering stained wooden boards over a deep shade of paint, as in this fantastic example from J & J Design Group. Strongly contrasting stripes are certainly not your only option. This wallpapered accent wall shows off the soft, almost textured look of tone-on-tone stripes. What a pretty touch of softness in this midcentury contemporary bedroom. Use punchy bright stripes on an accent wall to balance similar tones in a bold window treatment, as in the Hollywood Glam bedroom from Lucy and Company shown here. So pretty. While gray has become a classic color for the bedroom, there's no denying that it can be a little bit, well, drab on its own. To the rescue: stripes in a pretty color. Jen Hadfield of Tatertots and Jello choose a soft aqua for her guest room's accent wall. While most often stripes run in straight, parallel lines, there's no law saying you can't break them up a bit with a few zigs and zags. What a great way to add style to a child's bedroom. The lively room shown here is from J & J Design Group. Colorful stripes aren't only for a child's bedroom, as this lovely master bedroom demonstrates so well. The secret is keeping the rest of the room fairly simple. Solid bedding, straight lines on the furniture, and an absence of clutter establish this space as all grown up. While stripes are often used to add impact, sometimes, as in this pretty bedroom from Lucy and Company, whisper-soft stripes provide a dreamy backdrop to strong color and pattern used throughout the rest of the space. Just because you have a tiny bedroom doesn't mean you can't have some fun with your decor. Bold horizontal stripes, as in this room from Centsational Style, actually makes the space look a little bit larger. Stripes and florals go together like peanut butter and jelly. When the stripes are tone-on-tone, as in the lovely French country bedroom here, the look is dreamy, not dramatic. So pretty. Thin lines spaced like a music staff add interest to a man's bedroom. What an easy way to wake up a beige wall. Just because you rent doesn't mean you can't wake up your bedroom walls. Stretch a length of fabric over a wood frame, paint stripes in your favorite colors, and then prop it up at the head of your bed. Voila! You have an accent wall that won't void your security deposit. Solid dark gray walls are certainly dramatic but can be cave-like. Chase away the gloom with tone-on-tone stripes in the darkest of grays. Now the look is pure sophistication and unfussy glamor. Stripes are a classic pattern in several decorating themes, including country, cottage, and coastal designs. The simply striped wallpaper here adds so much interest to this pretty country bedroom. Want to add lots of style to a guest bedroom or shared boy's room? Then use two colors of stripes to create a wide border around all four walls, as in this room from Dwell by Cheryl. For the boldest style, add a large "frame" in the center of wide horizontal stripes, and use the spot to show off a prized piece of artwork, or something unexpected, like the baseball bats in this bedroom from Mary Cook Associates. Zigzag, almost chevron, stripes are a bit much for a master bedroom, but loads of fun in a child's room. The colorful mix of thin and wide stripes here certainly wake up this girl's bedroom from Linfield Design. Black and white is a classic combo, and for good reason. It's sophisticated, elegant, and perfect as a backdrop to a gorgeous piece of furniture, such as the headboard that is shown here. This beautiful bedroom is from design firm space grace & style. The odd configuration of an attic bedroom can make decorating difficult, but not when stripes come to the rescue. Make even more of a decorating scene by running the stripes in different directions on the walls, as shown here.